Hey hey, you must be bored! “Missy, believe it or not, I do actually have some things to take care of now." "Well, since you came to visit us, I’ll play with you for a while." "Let me see what you've got now." "Yeeha! The Deadly Grouch tries to outsmart the shiny thing!!" "Yay! Special moves by Loaf!!" "I’ve got to stop, I can’t stop laughing! You guys can’t play catch for peanuts! Mr.Arnold would have caught it in a single swipe!!" The Grouch, Loaf, and Arnold were rescued from a house that was full of garbage. All the cats that were rescued from that same house are very easy going, unique and friendly. We brought them all to ARK, and things are going well with their treatments and neutering/spaying. However, they’re not living in a cat enclosure. They’re living in a quarantine room where newly rescued animals are kept temporarily. But we don’t have enough quarantine rooms and some cats have to spend their time in a small room in the hospital unit. Most of these animals are very adaptable to new environments and easy to care for. 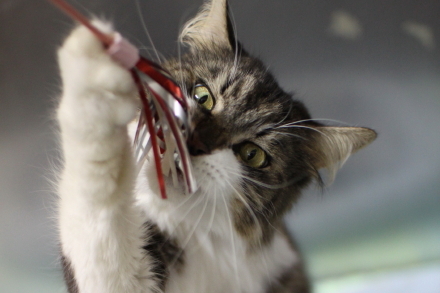 If you’re considering getting a cat or if you like longhaired cats, please come to see them. We’re also in need of donations of cat food for them. Please click here for more details →"Cats from Izumi City"
This is a report on an adoption event that took place at Field Note on 17 October (Sun). An exhibition of photographs by Kyoko Harada took place at the same time. Well, at this adoption event, we had no applicants for fostering. Usually, even if we don’t have any foster families decided on the spot, we usually get some positive feedback such as people being interested in visiting ARK later. This time was unusual and we didn’t get any enquiries about fostering. However, all hail Field Note, a lot of ARK supporters came by with donations of supplies and to give us moral support. And we were able to see the sides of the dogs that we don’t normally see at ARK. We had Jex join us because we wanted to let people know how wonderful senior dogs can be. Even though he was surrounded by strangers in a new environment, he was very calm. It must have been his old age. He doesn’t have any health problems and he’s a very obedient dog. He comes highly recommended. His only weakness is that he’s not keen on lightning. Cracker destroyed the cage he was put in when he was rescued by ARK. 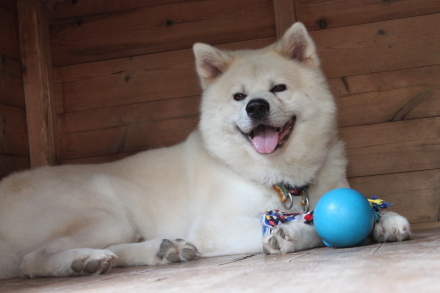 Cracker doesn’t get along well with other dogs and so lives alone in a dog enclosure. He barks at strangers who pass by his enclosure, so we’ve placed him away from areas where people walk past. But in fact, he actually loves people, he’s very affectionate, and he doesn’t have bad habits like pulling on the lead when we take him for a walk. We really wanted to give him a chance, so we brought him along this time. We thought it would be ok if a member of staff stayed with him to pay extra attention to him and the other dogs. But when other dogs came to rub up against him or to sniff his behind, he didn’t mind at all. 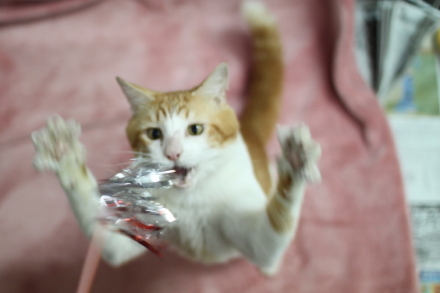 Okota bit him twice, but he didn't let that bother him either. And to top it off, even though he was in a new environment for the first time, he was relaxing with his belly up. He was crying in his crate on the way there and back, but he calmed down after a while and he didn’t damage the crate. We found out that Cracker is a much easier dog to live with than we first thought. 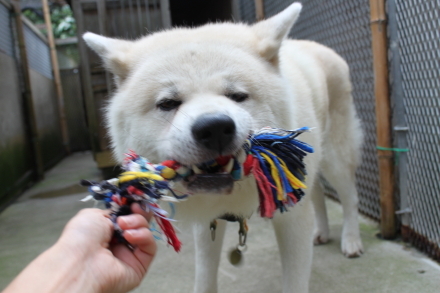 Okota is still new at ARK, so we haven’t had a chance to get to know him that well just yet. He’s a very good dog, but he seems very inexperienced and seems to bark at anything, really. He barked a lot on this day as usual. It isn't always good to give a dog attention, care and concern just because he’s barking, so we thought we’d try different approach in handling his barking. Well, he barked a lot and went for a walk, so he definitely burned more calories than usual. Perhaps it was good for his diet! Hana was such a good girl. 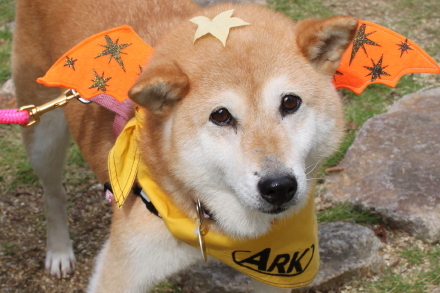 Many Shiba dogs can be bit prickly, but she’s a very calm, gentle girl. She was sweet with little children and friendly to everyone. She has a heart condition and takes medication on a regular basis, but this doesn’t limit her activities and she leads a normal life. The medication is also preventative, so there’s not much to worry about if you are interested in becoming her foster family. We staff really hope that she’ll find a foster family before the cold weather comes to Nose - it can be very difficult to bear. When Punba was returned to ARK, he panicked and became depressed. We were a bit worried about him being in an unfamiliar environment, surrounded by people. He was a little scared, but stayed calm. He didn’t get startled when strangers petted him or when little children were being loud and active around him. 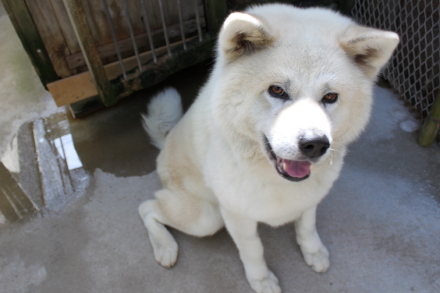 He has no problem taking a walk in residential areas, so we have no worries about sending him to a foster family. 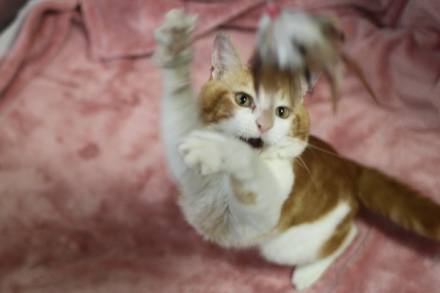 However, it’s a little challenging to find a foster family who’ll see his true charms hidden underneath his shyness. 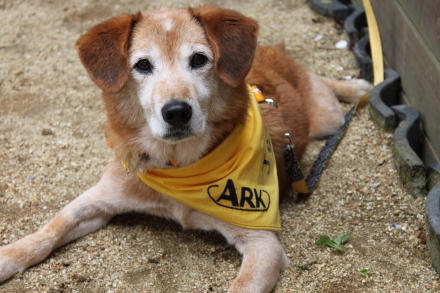 At the moment, she lives with Punba at ARK, and at the adoption event she didn’t leave Punba's side. They’re so good together, we were saying that it would be such a great thing if they found a foster family that would take both of them. We would like to thank Field Note who has ARK Support Fair twice a year. We feel lucky enough to be given an opportunity to raise awareness of ARK’s work and to be given a place for animals to seek their chance for a warm home, but the staff were also provided with delicious bread and cakes, and a place to take a break. We cannot thank you enough for your kindness. Usually at adoption events, we have to take a break or eat something in the car on the way there or back, but this time we were treated so well and felt very special! And we would like to thank all those who made a donation; we appreciate it more than words can express. 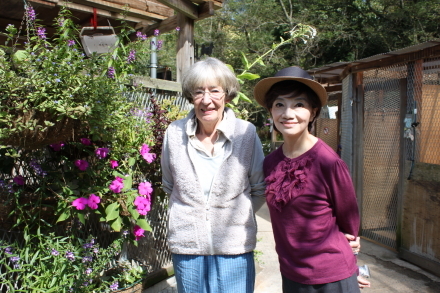 Today, Ms. Tomoko Matsushima came to visit ARK. She’s an actress and singer. She’s going to introduce ARK on the "Hanashi no Tokushuu" section of a TBS radio programme called "Doyou Wide Radio Tokyo Eirokusuke Sono Shinsekai." She came to interview us today. The date of the broadcast has not been decided yet, but it’s a programme for the Kanto area so unfortunately we won’t be able to hear it here in Osaka... Ah! Nowadays we can listen to the radio on a computer....?! 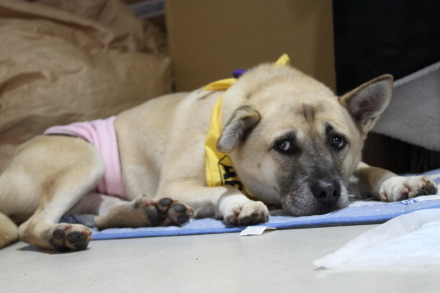 Ms. Matsushima is the director of Japan Society for the Prevention of Cruelty to Animals. She read a newspaper article about Ms. Oliver and was touched by it, so she decided to visit ARK. She was youthful and beautiful: what a great actress! There are less than 3 months left of this year. 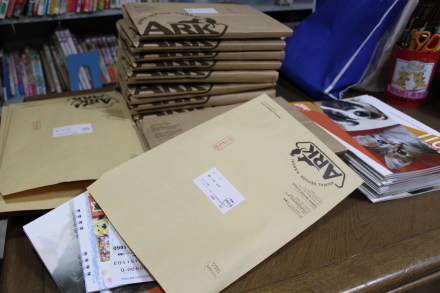 Thanks to our ARK supporters, we’ve received a constant stream of orders for our calendar. Every day, between our other daily tasks, we’ve been preparing calendars for shipment. We’ve carefully sorted out the calendars for each order every year, but because it isn't something we’re used to doing on daily basis, we have made some mistakes in the past. Please accept our apologies if any of your orders were mixed up in the past. We’ve also received a phone call like this; "Friends that I was ordering an ARK calendar for have started to order their own so now unfortunately I have to reduce my order." The concept of animal welfare is slowly getting through to more of the public, for which we’re very grateful, and the warm comments and feedback we get with orders are such a great motivator for us all. The warmth and gentleness of ARK’s animals has been captured by Kyoko Harada and this year's calendar is very charming. All profit from the sale of calendars will be used to support ARK. Your support allows ARK to help more animals, and we would like to ask for your generous support. We also appreciate any feedback you provide us with on your purchase of ARK calendars. Tomorrow will be another hectic day; here we go!! 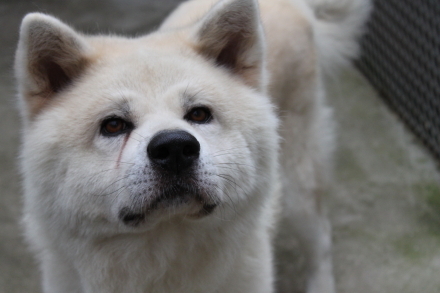 For seven years, this Akita dog served as the watchdog for a factory. Although he was a watchdog, the factory workers took good care of him. That is how and why Atlas came to ARK. says, “No!” and the staff doesn’t know what to do. Maybe this is just the opposite of the loneliness and longing for companionship that he’s feeling. but has no other health problems and is still very energetic. 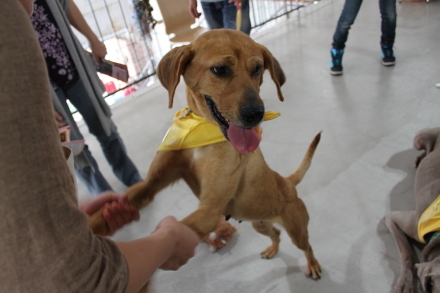 Despite the sudden move to the shelter at this age, he is friendly to everyone. 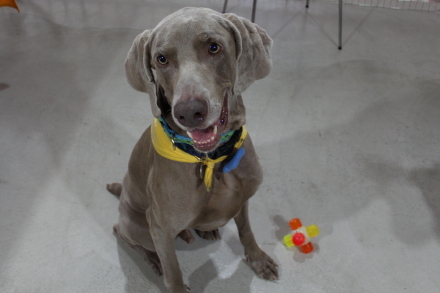 Living as the factory’s watchdog for seven years, Atlas now lives as ARK’s dog. Would you want to live alone in a nursing facility? of my days with people I love. Animals cannot make these decisions for themselves. But they only want one thing. length of time spent together, but the quality. To those people who worry, “If I don’t raise the dog from when it’s a puppy, then it won’t bond with me and I won’t be able to teach it manners,” I hope to be able to convey my message well. ★Won’t you join us at the Halloween BBQ Party? 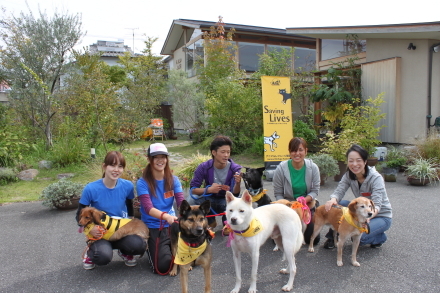 The Osaka branch of George held their second adoption event on 2 October (Sun). The first adoption event was delayed due to unexpected traffic, so this time we arrived early, before the shop opened. We went to a nearby park called Utsubo Park for a walk and lunch. Later, the adoption event started. There were some couples who were interested in becoming a foster family, but unfortunately matters such as restrictions on the size of dogs allowed in their apartment, or the fact that they didn’t have a car, so would have to use their bicycle to take the dog to the vet became an obstacle for them. But they did like our dogs very much. Visla was such a good girl in the crate on both the rides going there and back. 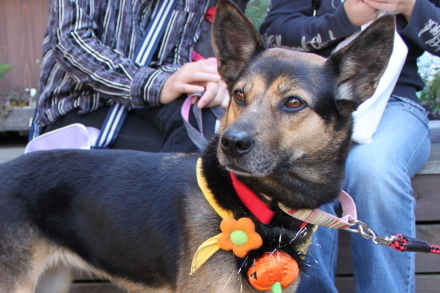 At the adoption event, she was very affectionate and playful with people, and she enjoyed playing with toys. She can move so lightly - she can jump on a table easily, and she was trying to jump over the fence. We had to keep our eye on her. When she jumped up on a table in front of the window that was open for air, our heart almost stopped. Tany got too excited and bit Popo, ex-ARK dog who came by to play. So he had to wear a lead when other dogs were around. He was a good boy playing with Winky, who he hardly knew. Tany is rather reserved when he’s at ARK, and gets pushed around by his roommate Visla, but today he was different. 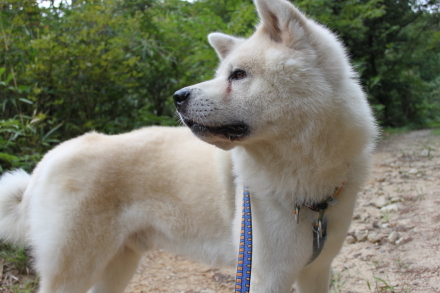 He held his head up high and confident at Utsubo Park and on a busy street. At the adoption event, he was just very affectionate towards people, asking them to pet him. 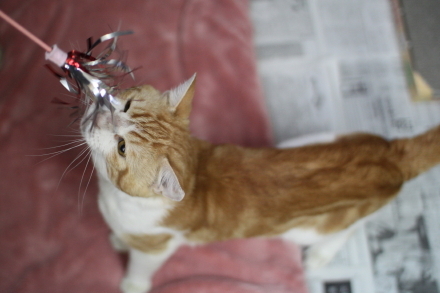 Modest, affectionate Tany with his soft fur was a popular boy. Ardbeg was following our staff member KK around as usual, but he did start to show some interest in other people, too. He gets a bit excited when he sees men, as he used to be rather scared of them. Whenever he heard "welcome" from downstairs, he started to greet people who were coming up the stairs with his wagging tail. He showed off his favourite winding dance, passing wind fearlessly (pardon him but it’s true!). Despite his handsome looks, he revealed his baby-like qualities and didn’t hold anything back. Winky was rather hyper - he was playing with toys, playing with Tany, playing with people's hands, and playing with shoe laces... Just full of energy and playing non-stop. Some people got a bit discouraged by his hyper behaviour, though when he was pulling Tany's lead playing "let's go for a walk", he brought smiles and laughter to all of us. He’s not a timid dog. He’s very friendly and comes highly recommended, but he’s still not found a foster family. I wonder why? Those of you who came to join us on the day, I would like to thank you and also to invite you to visit us at ARK. I am sure you will find The One for you. 200 dogs and 150 cats will be waiting for you! 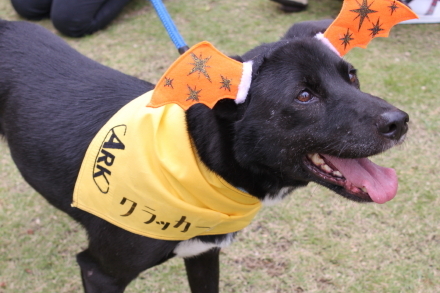 And foster families of ARK animals who came to join us, thank you very much for coming with your cute little ones! 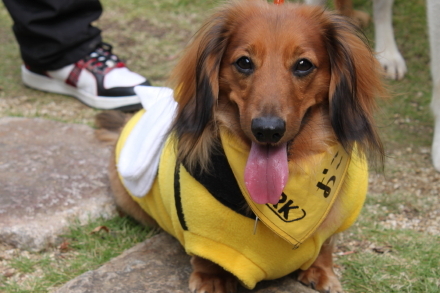 A family who visited us at George came to ARK, met other dogs as well and chose Winky. Winky will be staying at ARK a bit longer until his foster family prepare their home to welcome Winky.